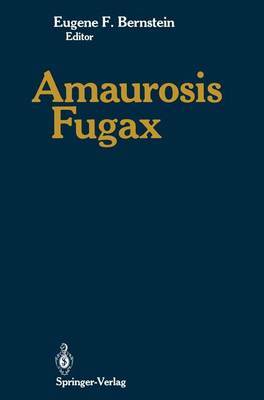 Amaurosis fugax, or "fleeting blindness," has been known as a clinical entity for hundreds of years (1). Since 1859, we also have understood that the phenomenon frequently is related to atheroembolic disease and that it is considered a classic manifestation of ocular transient ischemic attacks and a potential precursor to stroke. However, many questions about this syndrome have remained unanswered until quite recently, when a great deal of new information and thought has been directed to the subject. Transient monocular blindness (TMB) is only one manifestation of a complicated syndrome of ocular, systemic, and cerebral diseases that may include some degree of monocular blindness. The duration of blindness varies from very brief (seconds) to complete and permanent. The per- manent type is referred to as ocular infarction or ocular stroke. Retinal infarction is the most severe degree of monocular blindness and usually is due to embolic occlusion of the central retinal artery or one of its branches. Varying types of arterial emboli have been described, including thrombus, cholesterol, platelets, and fibrin.